When you think about snakes in the wild, you probably wouldn’t be blamed for conjuring up images of dusty deserts in the Sahara or thick Amazon jungles. You might not immediately think of good old Britain! In fact, there is a large population of adders in our country and these venomous snakes could provide a potential threat to our beloved dogs. At The Insurance Emporium, want to help you keep your pet pooch safe. That’s why we spoke to our pet health expert about the risks adder bites to dogs! The adder is the only venous snake native to Great Britain. 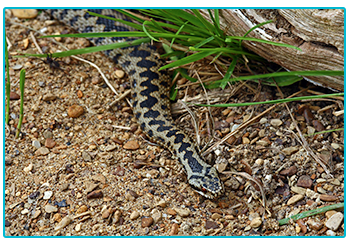 Growing to an average length of around 65cm, adders can be recognised by the distinctive black and brown zigzag pattern along their back and the ‘v’ or ‘x’ shaped markings on the back of their heads. Their venom is relatively strong but the adder doesn’t inject much at any one time so pose less of a risk than other venomous snakes. Adders are relatively common across the entire UK and don’t tend to live in any particular part of the country. Their preferred habitat is in sand dunes, rocky hillsides, moorland and on the edge of woodland. The areas that they choose are usually full of their preferred pray, such as small mammals. Their liking for open ground is part of the reason that they often come into contact with humans and their pets. How can a bite occur? Most bites occur between April and July, in the afternoon, as this is when adders are at their most active during the heat of the day. 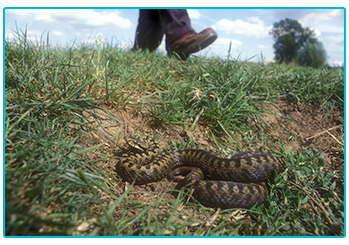 Bites often occur when an adder has been stepped on or disturbed by a curious dog. If your dog has been bitten there will often be signs of pain, bleeding, bruising and distress. This will often include panting, vomiting, diarrhoea, drooling, lethargy and a wobbly gait. What to do if your dog is bitten? On rare occasions, a bite can lead to blood clotting, seizures, collapse and death. As a result, you must seek immediate veterinary treatment following a bite. It’s important that you don’t allow your dog to walk and ensure you carry them. Keep them quiet and warm, if possible you should bathe the bite in cold water to help reduce the swelling. Don’t panic, most dogs survive with the right veterinary treatment! 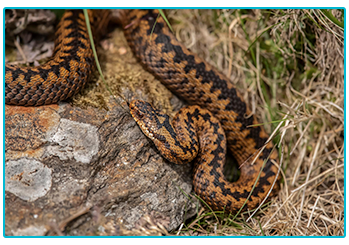 Adder bites are not particularly common for dogs in the UK, however it could be important to know the risks and have an awareness of what you can do to help your pet should they be bitten. If you take the right steps to seek out treatment for your pup, they should be back to themselves in no time!